Buskin’ Blues is an oral history documentary film that follows the buskers of one town in North Carolina, Asheville. 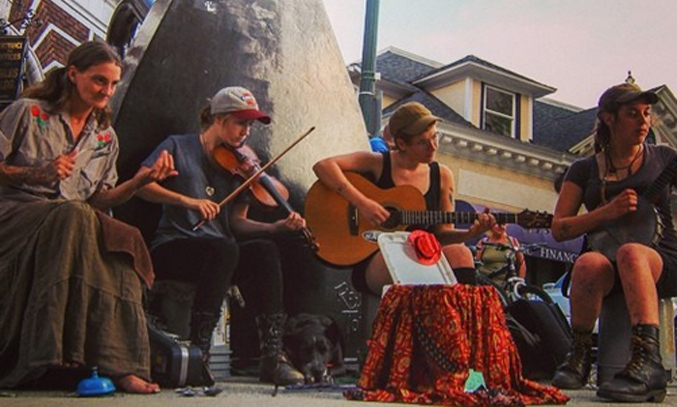 The small mountain town has a large sub culture of street buskers and performers. This is a major element to the areas tourism and can bring great profits to those that go out and get it. After a morning film makers discussion with the director Erin Derham, the film promised to be a great insight into a world of busking and music. But the film itself failed to live up to this. Had the talk not happened, the film would have been less clear and even with the added knowledge it still lacked any real point. It was a great outlet for the many styles of music and the buskers that wanted to be seen but you don’t really get to know their history. Which as a oral history documentary really loses its attraction. There is talk of codes of conduct, regulation, and respect. How businesses and buskers can work together to create an attraction that benefits both sides, whilst still keeping its charm and authenticity as a street performance. There is a slight insight when they are asked where they have played, and they all real off a list of country’s and towns, but everything else is a mystery. The buskers are guarded and this we are told is because they don’t want to lose the mystery that busking is. Who is this person outside of the situation? How much do they earn? What bought them to this point? All questions that never get answered. Or even asked. You feel that Erin probably knows the answers but it isn’t communicated to the viewer. And she could probably make a whole new film now she has gained their trust, maybe this is just the beginning of the story. Maybe a bit of narration about the history of the town as a Mecca for buskers would help tie into the characters that are followed. Great soundtrack but for a history documentary Buskin’ Blues lacks any history.